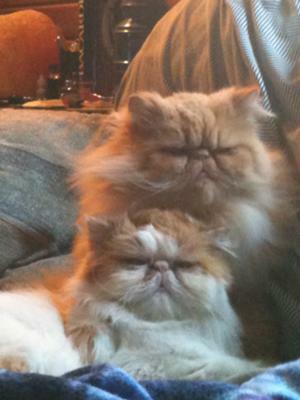 I have 2 Persian cats, Bridget - a 4 yr female red and white bi-color (retired show cat) and bug - 2yr male, classic orange tabby with white, both have been diagnosed with cat ear herpes and because they are extreme face Persians, when they have their outbreaks- they also come down with bad upper respiratory problems. I have tried lysine as well - did not make any difference. I have used the drops which I find work better than the BNP ointment-the only thing is the drops are only good for 30 days-then you have to toss it (bacteria will grow and using the expired drops can give an eye infection) so i make sure I have BNP ointment on hand all the time. I also will put them in the bathroom when ever someone has a bath or shower - it helps loosen all the snot and congestion. My veterinarian tells me that they have taken everything that goes wrong with every breed of cat and bred it in to one and that breed is the extreme face Persian. life, he also has an auto-immune disease too, so he is on vitamin E and fish oil as well. Does anyone have any similar situations, but have used different remedies or medication that their vet had prescribed? I feel so bad for my male it seems that his eyes are always bothering him, he is always squinting, always dark brown gunk coming out of his nose and eyes. I’m afraid that you are right. We have bred Persian cats to have facial features that put them at much higher than normal risk for recurrent respiratory and eye problems, often caused by herpes virus infection. Normal anatomy is vital for protecting against disease, and there is nothing “normal” about the extremely flattened face of some Persian cats. That said, there are treatments available that could help your cats. If your veterinarian thinks a secondary bacterial infection is at least partially to blame for your cats’ symptoms (a culture of nasal or ocular discharge can help diagnose this) he or she can prescribe a 10 day course of a powerful antibiotic like azithromycin. Some vets will also keep these kitties on this medication long term (usually giving it twice a week) to try to prevent a relapse. An antiviral medication like famcyclovir can also help keep the underlying problem of herpes virus infection under control. Thank you Dr.Coates for your response. My male Persian bug recently had to have an emergency extraction of 3 teeth (it turned out poor bug had to have 9 removed). Also with his allergies and to keep his gums from flaring up blood red is on predisone for the rest of his life. He's also a classic RED tabby persian with an extreme face so I have to constantly watch his weight (nothings worst that a FAT red Persian with all these problems) thank god for prednisone. Believe it or not it has helped his out breaks with the eye herpes which I was really nervous about giving him a steroid with his eye herpes, me and vet are leaning towards maybe it was allergies and not the herpes virus ( my female Persian has E.H, as she does get out breaks and the ulcers plus bug is always cleaning her face). I agree w/ my vet when he said that they took everything wrong with each breed of cat and bred it in to one and got the extreme faced Persian as the result- are you in agreement? He almost fell down when I told him that I wanted to get a French bulldog! Join in and write your own page! It's easy to do. How? Simply click here to return to Herpes Virus.